Renal phosphate handling critically determines plasma phosphate and whole body phosphate levels. Filtered phosphate is mostly reabsorbed by Na+-dependent phosphate transporters located in the brush border membrane of the proximal tubule: NaPi-IIa (SLC34A1), NaPi-IIc (SLC34A3), and Pit-2 (SLC20A2). Here we review new evidence for the role and relevance of these transporters in inherited disorders of renal phosphate handling. 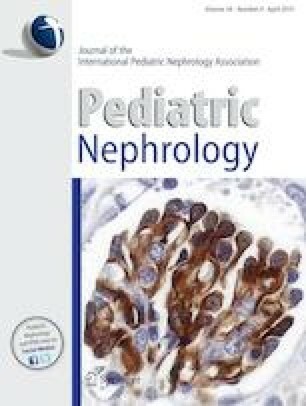 The importance of NaPi-IIa and NaPi-IIc for renal phosphate reabsorption and mineral homeostasis has been highlighted by the identification of mutations in these transporters in a subset of patients with infantile idiopathic hypercalcemia and patients with hereditary hypophosphatemic rickets with hypercalciuria. Both diseases are characterized by disturbed calcium homeostasis secondary to elevated 1,25-(OH)2 vitamin D3 as a consequence of hypophosphatemia. In vitro analysis of mutated NaPi-IIa or NaPi-IIc transporters suggests defective trafficking underlying disease in most cases. Monoallelic pathogenic mutations in both SLC34A1 and SLC34A3 appear to be very frequent in the general population and have been associated with kidney stones. Consistent with these findings, results from genome-wide association studies indicate that variants in SLC34A1 are associated with a higher risk to develop kidney stones and chronic kidney disease, but underlying mechanisms have not been addressed to date. The online version of this article ( https://doi.org/10.1007/s00467-017-3873-3) contains supplementary material, which is available to authorized users. Phosphate is the third most abundant anion in the human body and accounts for about 1% of total body mass. Approximately 80–85% of total phosphate content is stored in bone in the form of apatite, contributing to bone stability, about 15% is distributed in soft tissues, and only 1% is contained in the rapidly exchangeable plasma pool. Phosphate balance depends on dietary intake and intestinal absorption, distribution between organs, and renal filtration and reabsorption. As discussed below, it is mainly renal handling that is tightly regulated, thereby exerting ultimate control over whole body phosphate homeostasis. The recommended daily allowance (RDA) for phosphate is age-dependent, with infants recommended to receive daily about 100–275 mg and children and adolescents 460–1250 mg/day . In growing children the phosphate balance should be positive to support building of bone and growth of soft tissues. In adults, intestinal net absorption and renal net excretion should ultimately remain zero to avoid phosphate overload or deficiency, respectively. However, in most industrialized countries the phosphate content of food exceeds the RDA [2, 3, 4]. The mechanisms underlying intestinal phosphate absorption are not fully elucidated. At present, experimental evidence from humans and animal models supports a bimodal pathway consisting of a transcellular, transporter-dependent pathway and a poorly defined paracellular route . The transcellular route involves the sodium-driven phosphate transporter NaPi-IIb (Npt2b, SLC34A2), which is mostly expressed in the jejunum in humans [6, 7]. The expression of this transporter is regulated by dietary phosphate intake and 1,25 (OH)2 vitamin D3 [8, 9, 10]. However, its overall contribution to intestinal phosphate absorption may be low, at least under normal phosphate intake, as evident from mouse models deficient for NaPi-IIb/Slc34a2 and from humans with the rare inborn condition of pulmonary alveolar microlithiasis caused by loss-of-function mutations in SLC34A2/NaPi-IIb [8, 11, 12]. NaPi-IIb-depleted mice do not suffer from hypophosphatemia or any other obvious sign of systemic phosphate deficiency unless challenged with a low phosphate diet [8, 13, 14]. During low inorganic phosphate (Pi) availability, NaPi-IIb-deficient mice become highly hypercalciuric, at least in part due to increased osteoclast activity providing phosphate to the organism at the expense of bone density . To date, no detailed analysis of phosphate balance has been reported in humans with SLC34A2 mutations. Two other phosphate transporters, PiT1 (SLC20A1) and PiT2 (SLC20A2), are also expressed in the small and large intestine at rather low levels, and their role and contribution to intestinal phosphate absorption are as yet unknown. Patients with mutations in SLC20A2 develop basal ganglia calcifications, but no other symptoms relating to systemic phosphate homeostasis have been reported . Renal phosphate excretion depends on the filtered load of phosphate and its subsequent reabsorption along the nephron. There is no evidence for active secretion of phosphate into urine. The bulk of tubular phosphate reabsorption occurs in the proximal tubule, with some evidence pointing also to a smaller component of active reabsorption in segments between the late proximal tubule and the connecting tubule . In the proximal tubule, at least three different sodium-driven phosphate transporters mediate the initial step of phosphate reabsorption across the apical brush border membrane: NaPi-IIa (Npt2a, SLC34A1), NaPi-IIc (Npt2c, SLC34A3), and PiT2 (SLC20A2) (Fig. 1) [17, 18]. As discussed below, all evidence suggests that NaPi-IIa and NaPi-IIc play important roles in humans and rodent models, but possibly to different extent. The basolateral exit pathway for phosphate remains unknown but may involve a mechanism of anion exchange [19, 20]. Also, the molecular identity of potential phosphate transporter(s) in the more distal nephron segments has not been reported. The three phosphate transporters expressed in the proximal tubule exhibit different transport modes, sensitivity to pH, and dynamics of regulation by dietary phosphate intake and phosphaturic hormones. Briefly, NaPi-IIa and NaPi-IIc transport divalent phosphate (HPO42−) whereas PiT2 prefers monovalent phosphate (H2PO4−). Moreover, NaPi-IIa and PiT2 mediate the electrogenic transport of phosphate because of their coupling of the transport cycle to two or three sodium (Na+) ions, respectively, leading to the net translocation of one positive charge per phosphate ion. NaPi-IIc transports only two Na+ ions per phosphate and is therefore electroneutral (Fig. 1). Domains in NaPi-IIa and NaPi-IIc involved in sodium and phosphate binding have been identified . Because of their different sensitivity to extracellular protons and preferred phosphate species (di- vs. monovalent phosphate), NaPi-IIa and NaPi-IIc operate most efficiently at a near neutral pH (~ pH 7.4–7.0), whereas PiT2 becomes more active at slightly more acidic conditions [18, 22]. Renal phosphate wasting can occur as part of several systemic syndromes, generalized inherited or acquired dysfunction of the proximal tubule (e.g. Debre–DeToni–Fanconi syndrome), and in a number of inherited disorders specifically affecting renal and extrarenal phosphate homeostasis (for review see [23, 24]). Most inherited extrarenal disorders leading to changes in renal phosphate handling are caused by mutations in fibroblast growth factor 23 (FGF23) or factors controlling FGF23 levels or in the sensitivity of target cells. Thus, disorders such as X-linked hypophosphatemia (XLH; PHEX mutations), autosomal dominant hypophosphatemic rickets (ADHR; FGF23 mutations), familial tumoral calcinosis (FTC; GALNT3 or FGF23 mutations), fibrous dysplasia (McCune–Albright syndrome; GNAS mutations), osteoglophonic dysplasia [FGF-receptor 1 (FGFR1) mutations], osteosclerotic bone dysplasia (Raine syndrome; FAM20c mutations), or autosomal recessive hypophosphatemic rickets (ARHR; DMP1 or ENPP1 mutations), also known as autosomal recessive hypophosphatemia (ARHP), are primarily extrarenal disorders affecting renal phosphate handling [23, 24, 25, 26]. In contrast, mutations in NaPi-IIa, NaPi-IIc and maybe also in NHERF1 (Na/H exchanger factor 1) directly affect the renal capacity to reabsorb phosphate. The roles of two other proteins potentially involved in renal phosphate handling, PiT2 and XPR1, are currently unclear even though mutations in the genes of both proteins have been described in patients. .
Mutations in SLC34A1 and SLC34A3 cause nephrocalcinosis and kidney stones. The pathogenesis of nephrocalcinosis in the setting of various inherited and acquired kidney diseases has recently been reviewed in much detail [27, 28, 29, 30]. The pathophysiology underlying nephrocalcinosis in patients with mutations in SLC34A1 and SLC34A3 is thought to be caused by the primary loss of phosphate with urine and the consecutive stimulation of 1,25 (OH)2 vitamin D3 synthesis leading to enhanced intestinal calcium absorption and calcium overload. Renal excretion of calcium causes hypercalciuria, which together with elevated urinary phosphate levels can trigger the formation of calcium-phosphate containing crystals favoring the development of renal calcifications. SLC34A1 has been linked to phosphate homeostasis in humans by several lines of evidence. A genome-wide association study (GWAS) for determinants of serum phosphate levels identified SLC34A1 among other genes, including FGF23 and the calcium-sensing receptor CaSR . Similarly, a GWAS for nephrolithiasis in a sample from the adult Japanese population linked a region near 5q35.3, implicating SLC34A1 (located at this site) in calcium phosphate kidney stone disease [32, 33, 34]. Also, the Icelandic genome analysis consortium identified SLC34A1 next to the CaSR and alkaline phosphatase as a risk gene for kidney stones and identified one specific marker within SLC34A1 as being associated with hypophosphatemia and low parathyroid hormone (PTH) levels . Homozygous and (compound) heterozygous mutations or small insertions and deletions in SLC34A1 were independently identified by several laboratories when investigating adult patients with kidney stones and reduced bone density  or pediatric patients with either hypophosphatemia and hyperphosphaturia , infantile idiopathic hypercalciuria , or with nephrocalcinosis and kidney stones [35, 39, 40, 41, 42, 43, 44]. Larger deletions including the SLC34A1 gene can occur as part of Sotos syndrome, which is characterized by learning deficiencies, facial dysmorphia, overgrowth, hypercalcemia, and nephrocalcinosis . To date, 29 distinct mutations have been identified in SLC34A1, most of which cause missense mutations, small in-frame deletions, frameshifts, or early stop codons, resulting in a truncated transporter [Fig. 2a; Electronic Supplementary Material (ESM) Table 1] [35, 36, 37, 39, 40, 41, 42, 44, 46]. Interestingly, most of these mutations appear to be located within regions predicted to be part of the transmembrane domains of the transporter. These regions are often highly conserved in transport proteins and are more sensitive to changes in their structure. Several of these mutated proteins were expressed and functionally analyzed in heterologous expression systems, such as Xenopus oocytes or the opossum kidney (OK) cell line resembling the proximal tubule. Collectively, these studies show reduced function of mutated transporters, mostly due to trafficking defects, with mutant proteins being retained intracellularly [37, 38, 41]. However, one mutation is of particular interest: a small in-frame deletion of seven amino acids at the N-terminus of NaPi-IIa (91del7) was identified in several patients as either one of two mutated alleles (compound heterozygous patients) or as homozygous mutation in at least one patient . All of these patients showed symptoms similar to patients with other pathogenic mutations, suggesting that this mutation is deleterious. However, in vitro analysis in Xenopus oocytes showed no obvious transport defect [38, 47] whereas expression of the mutant protein in OK cells suggested reduced apical expression and partial retention, pointing to a possible trafficking defect . Interestingly, inspection of public data bases like the ExAC revealed a high allele frequency of 0.018, suggesting that approximately 2% of the general population are heterozygous carriers of this mutation. The combined allele frequency of all proven pathogenic exonic mutations is 0.022, whereas the total allele frequency of all nucleotide changes leading to an altered amino acid sequence adds up to 0.07. The relevance of this finding is currently unclear but may link to an increased risk of developing calcium phosphate kidney stones in adulthood. In pediatric patients, SLC34A1 mutations have been found to be mostly homozygous or compound heterozygous and the pattern of inheritance to be autosomal recessive. In one study no obvious pathology was detected in parents or other family members carrying only one affected allele. In contrast, three adult patients were described with only one allele mutated and presenting with calcium phosphate stones and reduced bone density . However, no further genetic information was available and considering the relatively high frequency of stone disease and its association with reduced bone density in the adult population, it remains unclear whether the symptoms in these patients were caused by SLC34A1 mutations. Moreover, detailed functional analysis of the two reported gene variants yielded no obvious defect . Also, in other families of affected homozygous patients, heterozygous carriers did not present with a high frequency of kidney stones, suggesting that heterozygosity per se may not cause a higher risk for kidney stones . However, results from GWAS clearly support a role of SLC34A1 in stone disease [32, 33, 35]. NaPi-IIa interacts with itself by forming homodimers of two transporters . Both subunits function independently in the healthy state . It is unknown at which cellular level the interaction occurs (e.g., at the level of the endoplasmic reticulum, Golgi, or plasma membrane) and whether the interaction of a normal transporter with a mutant transporter may accelerate degradation or reduce membrane insertion. Interactions between a normal and mutant transporter could reduce overall NaPi-IIa expression by up to 75% and thereby help explain some of the clinical observations made in heterozygous carriers of NaPi-IIa mutations. Thus, it remains to be examined whether additional genetic or environmental factors together with the presence of one mutated allele may cause a higher risk for kidney stone disease. Indeed, a mouse model of Slc34a1 deficiency presents calcium phosphate and calcium oxalate containing renal calcifications when challenged with high phosphate or oxalate diets [51, 52]. Slc34a1 knockout (KO) mice, similar to human patients with SLC34A1 mutations, are hypercalciuric [38, 53]. The renal loss of phosphate stimulates activation of 1,25(OH)2 vitamin D3 by the renal 1-alpha-hydroxylase (CYP27B1) and reduces inactivation by the 24-hydroxylase (CYP24A1). The elevated levels of 1,25(OH)2 vitamin D3 stimulate intestinal phosphate and calcium absorption. Calcium is excreted by the kidney, causing hypercalcuria and an increased risk of nephrolithiasis and nephrocalcinosis. Consistently, restricted 1,25(OH)2 vitamin D3 synthesis (or lower vitamin D3 supply) and enhanced phosphate supplementation reduces renal calcifications . Thus, children with SLC34A1 mutations likely benefit from phosphate supplements and should not receive standard vitamin D3 supplements during the first years of life. Whether the mutation of one allele is sufficient to trigger a similar mechanism is currently unknown but may depend, among other factors, on dietary supply of vitamin D3, phosphate, and calcium. Mutations in SLC34A3 are the cause of hereditary hypophosphatemic rickets with hypercalciuria (HHRH) [55, 56, 57]. In contrast to patients with mutations in SLC34A1, rickets is a common feature together with hypophosphatemia, hyperphosphaturia, hypercalciuria, and elevated 1,25(OH)2 vitamin D3. Consequently, many patients develop kidney stones or nephrocalcinosis. It appears that the problems experienced by patients with mutations in SLC34A3 persist into adulthood, whereas the clinical symptoms in patients with SLC34A1 mutations may improve with reaching adulthood. This difference suggests that NaPi-IIa may play a more prominent role in earlier phases of life and that NaPi-IIc may be the more important transporter in the adult kidney (in contrast to rodents where NaPiIIc appears to be mostly expressed during growth). However, this hypothesis is based only on few observations, and longer follow-ups are required in patients with the different mutations for any definitive conclusion to be reached. To date, 32 different mutations in SLC34A3 have been reported [55, 56, 57, 58, 59, 60, 61, 62, 63, 64, 65, 66, 67, 68, 69, 70], including mostly missense mutations, mutations affecting potential splice sites, and smaller and larger deletions causing premature stop codons with expression of a truncated transporter (Fig. 2b; ESM Table 2). Some of these mutations have been further characterized using in vitro expression systems and found to cause mostly retention of NaPi-IIc in the endoplasmic reticulum, but also to reduce its stability in the plasma membrane or to decrease its transport activity [57, 58, 62], similar to findings for SLC34A1 mutations. Proven pathogenic SLC34A3 mutations (allele frequency 0.002) are less frequent in the general population than are those for SLC34A1. However, when suspected mutations are considered (e.g., without clear genetic or experimental proof), total allele frequency increases to 1.5, but mostly due to two very frequent allele variants with nearly 0.4 and 0.8 allele frequency, respectively. At this point in time, the relevance of NaPi-IIc activity is unclear, and better genetic and experimental evidence is needed to provide insights into whether these alleles may contribute to an increased risk to develop kidney stones as discussed above for SLC34A1. Different mouse models of NaPi-IIc deficiency have been created to further examine the role of the transporter and to gain better insights into the pathology of HHRH. A constitutive Slc34a3 KO mouse model showed normal growth and no evidence for renal phosphate losses, was normophosphatemic, and had normal bone growth and morphology . However, NaPi-IIc KO mice had hypercalcemia, hypercalciuria, and high levels of 1,25(OH)2 vitamin D3, whereas the FGF23 level was reduced . A second mouse model with an inducible deletion of renal NaPi-IIc was generated to examine whether acute or chronic compensatory mechanisms may mask some of the expected pathology in the constitutive KO mouse. Surprisingly, inducible NaPi-IIc KO mice showed no biochemical abnormalities and had similar levels of calcium in the plasma and urine as well as normal levels of 1,25(OH)2 vitamin D3 and FGF23. No evidence for compensation by other renal phosphate transporters, i.e., NaPi-IIa or PiT2, was found . NHERF1, also known as PDZK3 or binding protein 50 (EBP50), is encoded by the SLC9A3R1 gene and acts as a scaffold protein for brush border membrane-associated proteins in the proximal tubule. Among its binding partners are NaPi-IIa, the PTH receptor 1, and phospholipase C [73, 74, 75, 76, 77, 78]. NHERF1 stabilizes these proteins at the brush border membrane and creates a platform for PTH signaling to NaPi-IIa [73, 74, 78, 79, 80]. Prie and colleagues reported that eight patients with hyperphosphaturia and kidney stone disease carried heterozygous gene variants in NHERF1 [81, 82]. Expression of the L110 V, R153Q, and E225K gene variants in cell culture models was found to increase PTH-responsive downregulation of NaPi-IIa . The E68A variant was reported to disrupt the interaction with NaPi-IIa, possibly leading to destabilization of the transporter at the brush border membrane . Of note, all patients were only heterozygous carriers of the reported variants and, as noted by others, the same gene variants are found at high frequency in public databases, raising the question of whether the observed gene variants are causative for disease . Also, mice lacking only one copy of NHERF1 show no major abnormalities [78, 80]. The kidney expresses at least two additional proteins that may also participate in renal phosphate transport: PiT2 (SLC20A2) and XPR1 (xenotropic and polytropic retrovirus receptor 1). The expression and localization of PiT2 has been described in some detail in the rodent kidney. PiT2 localizes to the brush border membrane of the proximal tubule, colocalizing with NaPi-IIa and NaPi-IIc [84, 85]. More recently, a subset of patients with familial idiopathic basal ganglia calcification, a specific form of primary brain calcifications, was shown to harbor mutations in SLC20A2 [15, 86]. However, while other defects have been observed, no renal phenotype or disorders related to phosphate homeostasis have been reported to date. Thus, the role of SLC20A2 in renal phosphate handling and inherited disorders of mineral balance remains to be examined. XPR1 has been linked to phosphate transport based on its homology to plant and yeast phosphate transporters, on harboring an SPX domain found in various plants, yeast, and bacterial proteins involved in cellular phosphate homeostasis, and on the modulation of phosphate efflux from plant and mammalian cells with XPR1 deficiency or overexpression [87, 88]. It has been suggested that XPR1 may be part of the long-sought basolateral efflux pathway in epithelial cells of the kidney and small intestine and/or may participate in cellular phosphate sensing . Indeed, XPR1 mRNA expression is high in the kidney and small intestine of rodents. However, definite proof is lacking regarding the basolateral expression of XPR1 in the kidney and intestinal epithelia, as well as its implication in the actual transport pathway and/or cellular phosphate sensing in mammalian cells. The data presented to date clearly support a role in cellular phosphate homeostasis, but the conclusions drawn are mostly based on experiments from plant cells, yeast, or prokaryotic systems. Interestingly, mutations in XPR1 are also found in some patients with familial idiopathic basal ganglia calcification [90, 91]. However a renal involvement has not been reported to date. A recent study with an inducible kidney-specific Xpr1 KO mouse demonstrated a very severe disease with symptoms of a generalized proximal tubular defect, mild hypophosphatemia, and bone disease . However, the study did not provide definite answers to the question of whether XPR1 is part of the basolateral phosphate efflux pathway. Patients from two consanguineous families were reported that presented with hypophosphatemic rickets and renal phosphate wasting in the one family and with a generalized proximal tubulopathy, including hypercalciuria and only mildly increased urinary phosphate excretion, in the second family . Genetic analysis revealed two novel homozygous mutations, IVS4-2A > G and R124S, in the SLC2A2 gene encoding the GLUT2 glucose transporter. GLUT2 is localized at the basolateral side of proximal tubule cells and serves as the main exit pathway for glucose. Mutations in SLC2A2 are the cause of Fanconi–Bickel syndrome, which includes a generalized dysfunction of proximal tubule cells with urinary loss of low molecular weight proteins, bicarbonate, glucose, and phosphate [94, 95]. Of interest, mice lacking Glut2 in the kidney showed greatly reduced expression levels of NaPiIIa and NaPiIIc, which explains, at least in part, the urinary phosphate loss . Thus, mutations of genes such as those that affect the general function of the proximal tubule may also cause renal phosphate losses, as in Dent’s disease, due to mutations in chloride voltage-gated channel 5 (CLCN5) or ORCL (Oculocerebrorenal Syndrome of Lowe) [96, 97]. Genome-wide association studies have linked SLC34A1 to the risk for developing chronic kidney disease (CKD) [98, 99]. This association has been replicated in large cohorts with different ethnic background and shows a very high significance [100, 101]. Progression of kidney disease has been shown to associate with reduced SLC34A1 mRNA and protein expression in human kidney biopsies . However, whether the reduced SLC34A1 is the cause or consequence of kidney disease remains unclear. Detailed functional analysis of the genetic loci linking SLC34A1 to CKD risk and development in suitable animal models may be needed to unravel the nature of this association. Also, the frequency of single nucleotide polymorphisms in the general population and in patients with CKD has to be examined to determine the relevance of SLC34A1 for CKD. Nevertheless, the fact that rare pathogenic mutations in SLC34A1 cause nephrocalcinosis and progressive loss of renal function, at least in some patients, may suggest that less severe alterations in SLC34A1 function may contribute to a slower loss of kidney function in adults. The kidney is the gate-keeper of systemic phosphate homeostasis, and the severe alterations in mineral homeostasis found in patients with mutations in key players of renal phosphate handling underline this notion. Biallelic mutations in the coding regions of the renal phosphate transporter genes SLC34A1 (NaPi-IIa) and SLC34A3 (NaPi-IIc) cause massive renal phosphate loss leading to secondary elevation of 1,25(OH)2 vitamin D3 and hypercalciuria, driving the development of nephrolithiasis or nephrocalcinosis predisposing to progressive loss of renal function. Surprisingly, monoallelic pathogenic mutations in SLC34A1 and SLC34A3 are relatively frequent in the general population. Whether carriers of these mutations may have a higher risk for developing kidney stones remains to be fully established. Moreover, SLC34A1 is associated with the risk for developing CKD in the general population, but the mechanisms and its relevance to overall CKD risk remain to be examined. This work has been supported by the ERA-Net E-Rare Research Programme for Rare Diseases (IIH-ECC) and by the Swiss National Science Foundation supported National Center for Competence in Research NCCR Kidney.CH to C.A.W.